The IPBS zootechnics facilities are part of the life science «ANEXPLO/Genotoul» core facility of Toulouse which includes 8 other sites with complimentary technical skills. It provides services for rodents housing and technical support for the use of animals for scientific purposes. It is open to the academic and private scientific community at regional and national level. It offers a total surface of 700m² to house 1,500 Individually Ventilated Cages. The facilities are organized in 4 different zones of various health status: 2 SPF, one quarantine section and a BSL3 zone of 260 m². Specific equipment and laboratories for experimentation and surgeries are available. It offers permanent veterinary monitoring and health inspection according to FELASA guidelines as well as ethical evaluation through an animal welfare and ethics comity (C2EA1). 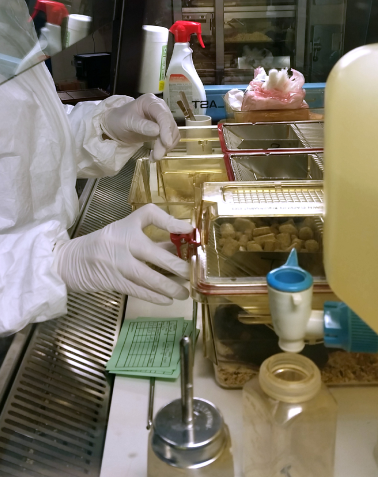 We have in particular a dedicated facility for the housing of infected animals (177 isocages, 4 isolators, and safety cabinets). It allows the development of infectious models, in particular with mycobacteria and other lung pathogens, including monitoring of physiological parameters and immune responses. Medical imaging systems are available for functional monitoring of infected animals. Equipment such as a cell sorter, flow cytometer, vibratome and inverted / upright multiphoton microscope are available for any scientific project. The Aninfimip project is an EquipEx (‘Equipement d’Excellence’) supported by the French government through the Investments for the Future program.